What are you doing for Christmas this year? We decided to take a short break from vagabonding and went back to celebrate Christmas with family in Canada. In contrary to the summery Australia that we just left behind, it’s cold and snowy here. Well, not that bad, it’s only -5 Â°Celsius (it’s about 23 Fahrenheit). Definitely could get worse, and we know some of you are in much colder places. 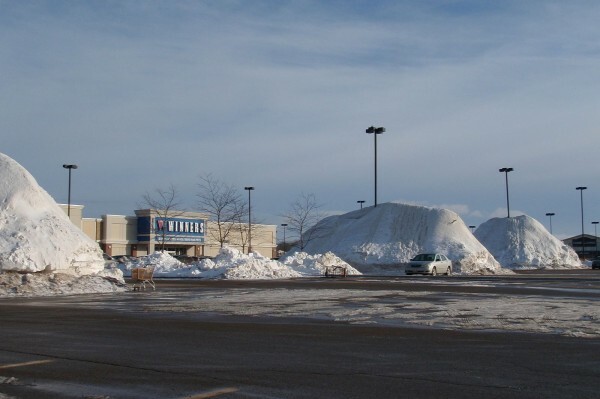 We picked the picture of snow piles in a shopping centre nearby to illustrate the normal scene in our place. Is it snowy in wherever you are too? I didn’t know you were from London! My parents live in Woodstock, my sister in Port Stanley. One of these days we’ll have to meet up in Ontario. Merry Christmas. Good to see you guys are doing well. Yeah, it is snowy here. We have 6 inches on the ground, but thankfully no more predicted. Wow, I think that’s quite true for me too. I don’t mean friends from right here. I mean the Canadian people that I met randomly abroad or in online travelblog community. Haven’t checked the weather forecast, but I assume it’s going to stay cold and will be snowy again until Feb or Mar. But that’s okay, snow is one of the reason we are coming home. We avoid snow when traveling because… well… not very comfortable we think traveling in the cold… and winter clothing can’t really fit the bag. So we missed the snow! We’re currently going through a typical Central Texas winter. One day it will be 24F degrees during the night time and the next it will be 77F (like today) during the day. The general consensus is, if you don’t like the weather, just wait an hour. I’ve never seen that much snow before! Haha, is that so! It’s quite flat cold here right now. The plus side is, you know what to wear without consulting the weather forecast! Merry Christmas and Happy New Year everybody! I wish this year will be successful for everyone.